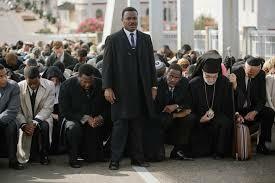 Oh the Glory of Selma! The movie Selma is a must see. The theme song "Glory" by John Legend and Common is a must listen. I just returned from watching the movie Selma with my friend Petrea. Coincidentally we had agreed to read The Warmth of Other Suns about the great migration of Black Americans to the north and west to escape the violence of Jim Crow. Then we scheduled our girls night out to see Selma and we had an urgency to finish this terrific non-fiction book. Isabel Wilkerson's wonderful account of three individuals who amplified the experience of 6 million Americans fleeing an intolerable situation, sometimes leaving everything behind, to seek freedom and opportunity for a better life. They often met the same racism though less formal. It helped us understand the climate of fear that Black Americans in Selma faced as they asserted their right to vote. I braced myself for what I thought might be more of history lecture and was wonderfully surprised by Selma's power as a story, beautifully photographed, and expertly acted by great actors. Selma was riveting. I had chills for the last third of the movie. I recommend this movie even to people outside of the United States. Martin Luther King, Jr. is a model of leadership that should resonate with everyone. The other sobering aspect are the echoes that still reverberate today. A defenseless young black man is shot by a state trooper in a restaurant. People are ridiculed for marching and "creating a civic disturbance." It takes place in Alabama and we could not help notice the parallel with the Supreme Court's decision to overturn ban on gay marriage in Alabama and the Alabama Supreme Court Justice's decision to defy the court's decision. It would be easy to shake our heads at those poor close-minded people in Alabama. Instead we tried to think of something we could do to make a difference for race relations and equality in Davis. We tend to be smug intellectuals who think we would never partake in anything so vulgar as what happened in Selma. But this is the town where a The Daily Show correspondent grew up and felt rejection because his family was from India. And where campus police sprayed mace directly into the eyes of student protesters. And where we never have our values tested, so we do not know if we have the courage of our convictions. It was a Wednesday night so we did not expect a crowded theater. We had it all to ourselves. Go to the theater this weekend and see this powerful and important movie. This blog post first appeared on Redesigning49.com. Newer PostBig News! First Publication and a Move! Older PostHappy Penguin Awareness Day!